Tuesday August 2nd 1898 I did baking and got dinner and Pink ironed. Jist before noon Lee and Mother came. It rained all afternoon. The boys went to the river and got a nice [mess?] of fish. The folks stayed all night. I sewed all afternoon to finish Wills shirts. Wednesday August 3rd 1898 I was busy a part of the forenoon with the dinner. The folks went home in the afternoon and I went as far as Stevens with them. Came back with Will. I practiced in evening. Thursday August 4th 1898 Will and I went to town. I did a lot of shopping and we got over home for dinner. I helped sew a little in the afternoon and came home before it was late. I practiced in evening. Friday August 5th 1898 I cut out my new lawn dress and sewed all day only stopping to help Pink some with the work. pleasant day. Saturday August 6th 1898 I sewed all day. Will went up to Coralville and stopped at Mary Woolfs for dinner. When he came home he told me that Joe Edwards was dead. Too bad, too bad. Sunday August 7th 1898 Will and I took an early start. I wanted to see some of the girls to borrow silver. It was nearly noon when we got back. I got dinner over and was busy most of the afternoon. I was down to Callie's jist before night. Karl is here now. 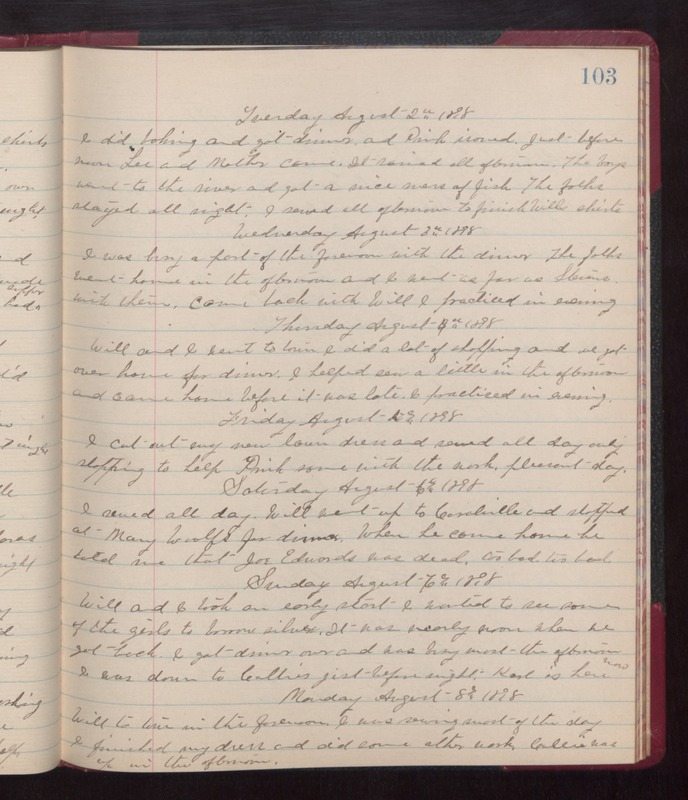 Monday August 8th 1898 Will to town in the forenoon. I was sewing most of the day. I finished my dress and did some other work. Callie was up in the afternoon.